When looking at monumental architecture such as the San Giorgio Maggiore Church, which we see off in the distance of this photo, most are too overwhelmed by the beauty to consider the budget. March 2014, single image, additional exposures for highlights, focal length 32mm, aperture f/8, shutter speed 121 seconds, ISO 400, 10-stop ND filter, tripod. 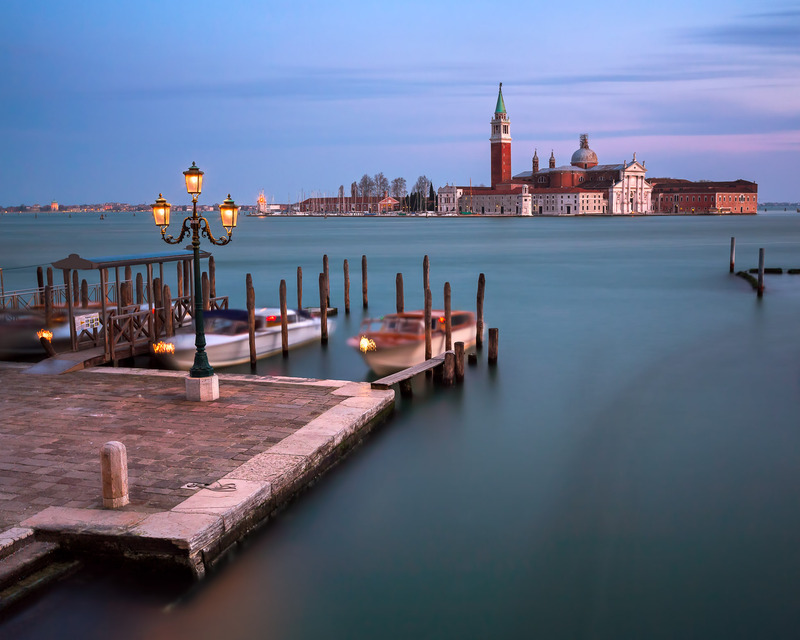 Would you be surprised to learn that San Giorgio Maggiore Church was built by an architect, Andrea Palladio, who was known for his ability to build Roman-like architecture on “the cheap”. One big money saver Palladio offered we can see on the white facade of the building. Rather than using expensive limestones, Palladio applied the method of using white stucco over a brick facade. From a distance, one certainly can’t tell the difference between the grand columned portico pictured here compared to classical examples. An artist is always faced with budget – whether it is supplies or time. Although I had already allotted a morning to shooting this scene, I decided to return one evening. The famous subject matter was certainly worth a second set of shots. The results proved fruitful since I found a new elevated shooting point on a bridge which showed the canal embankment, jetties with boats, lamps and San Giorgio Maggiore Church in the background. At this scene I waited until the moment the evening lights turned on to combine the natural glow of the sunset with the artificial lighting. I put on a 10-stop neutral density filter to achieve the long exposure to smooth the surface of the water and remove distractions like the many floating boats.